TODAY IS THE DAY! VACCINES DAY! I thought it would be an easy feat, considering they are small and easy to carry. NOPE. The clinic was a walk-in basis only. They said we might have to wait in the car (to prevent pups contracting something). 930am: Vet visit and shots for both mom and pups. Of course, the entire car ride sounded like the official Siberian Husky Choir. The pups are all about 9lbs, Loki being the heaviest. I was hoping that after this first round of shots that they could play outside, but the vet recommended not to until their last round of shots. This means, another 4 weeks of CLEANING. The pups took the injections well. Loki Jr was a little dramatic about it. He knocked out immediately after the first (and only, for today) shot. The deworming was taken orally from a little syringe. It smelled like bananas. Loki, of course, being dramatic, was still laying down, didn't want to open his mouth, so the vet had to force it in. Momma got her annual shots. She's doing well. Enjoy the pics! Yesterday the pups turned 5 weeks old. So, what's new? All they do is pee, and swim in their pee. The entire Anderson Home Theater Room has been transformed to a playpen. The entire floor is covered with a large tarp and we've scattered training pads in random locations. Of course, they either pee half on the pad, and half on the tarp, or NOT on the pads at all. FRUSTRATING! Luckily, clean up is relatively easy, but tedious. Every morning the playroom is cleared out. Toys, beds, and mats are all washed. Once everything has been cleared out, the rest is pretty easy---pick up poop, wipe down the entire tarp-covered area with a dry Swiffer/Clorox spray. Then run through a steam mop. The place is then left to dry while the pups are howling in the bathroom. This is done every day, so the house and the room doesn't even smell like there's a hoard of peepee monsters. Eh, well, I guess it isn't THAT easy. They have also started to eat puppy food. Kira has been weaning them off her teats--again, mother nature, and also their little puppy teeth are SHARP! Aside from being little peepee monsters, they are just simply, little monsters. They are a lot more active. It sounds like a bowling arena from downstairs with their tumbling and running around. Enjoy the pictures at 5 weeks! Next week is the big day! ROXI - THE PRINCESS. Unique markings, the smallest, and daintiest. Lexi: THE DIVA. Fiercest, plays hard. Yes, she sits like this and contemplates her next move. Loki Jr. - THE TERRIBLE. He is the escape artist, the first to cry every morning, and likes to wake up his siblings to play. He is the sweetest, though. Likes to be carried and licks a lot. 1. They have finally started walking, though, a little wobbly. They can stand on all 4's, but tumble over after a few steps. CUTE. 2. The first couple of weeks, their life consisted of: eat, sleep, repeat. Now, they're climbing all over their mom and gnawing each other's faces. CUTE. 3. The only one I've seen poop on their own so far is Loki Jr--he was crying while pooping. CUTE, but also heartbreaking to see because he was probably confused on what's happening. He'll get over it and soon realize it's the best feeling ever. He's definitely teething--starting to gnaw on the foam lining of the welping box. 4. They've start to develop personalities. Roxi, the first born, is quiet and keeps to herself. Loki Jr is the middle pup and demands attention. 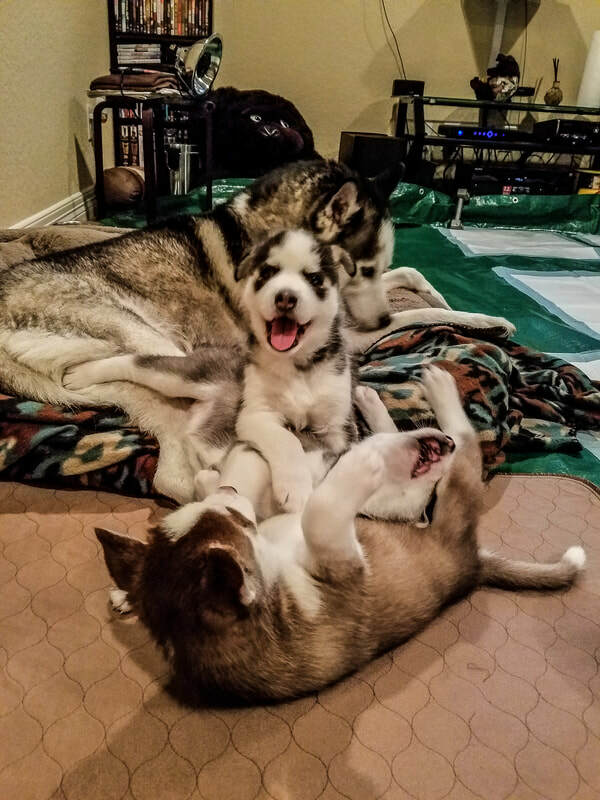 He's the one howling and smacking his siblings to wake up. Then there's Lexi, A.K.A, The Diva. 5. The Anderson's have finally made a decision on a pup! It's Lexi! 6. We had an impromptu puppy party. It was my aunt's birthday, but yet we all somehow managed to get together at the Anderson's and hang out with the pups. CUTE. Now, enjoy the overload of cuteness at 3 weeks. 1. They have finally opened their eyes! You can't see their baby blues just yet, but by week 3 they should fully open their eyes and pierce our souls with their icy blue eyes. 3. The male (Loki Jr.), I believe, will be the first to walk and first to transition. I've seen him stand on all 4's. Also, he's the first to poop on his own. Great, I guess? Poor guy kept on crying and hunching over, but he finally did the deed without momma's help. I cleaned it up quickly before Kira got to it because I didn't really want to witness that. FYI: Newborn puppies cannot eliminate on their own, so the mom licks them to stimulate elimination. She eats the waste. It's their nature to do this, because out in the wild, she needs to hide the scent of her puppies from predators. 3. Justin's mom has made a decision on a pup! Stay tuned! Kira, my Siberian Husky, gave birth to three gorgeous puppies---Racer, Red, and Timmy. Just kidding, we didn't name them. I'm a serial dog-adopter, so naming them wouldn't be a good idea. Justin's parents will have the first pick of the litter and we'll sell the other two. Thankfully, there's only three since that will leave us only two to find a good home. I figure it wouldn't be that easy though. We don't plan on selling the pups to just anyone. Yup, I have my interview-face ready. I think we should play the whole "bad cop, good cop." I plan on conducting sweat-worthy interviews, home inspections, pop quiz on Siberian Husky Culture, and a physical agility test--- just kidding (90% truth). Anyone who intends to name the pups after a "Game of Thrones" character are automatically disqualified. Ain't nobody got time fo' dat "I've got myself a dire wolf" crap. Kira was in labor for a good eight hours. Meanwhile, my anxiety was already giving birth to nervous farts and paranoia. My eyes were glued to my phone all night "researching" the welping, post welping, and pretty much the need-to-knows to CHILL OUT. Most of the information I read were pretty consistent, i.e., leave the damn dam alone, albeit most disclaimers read, "not an actual veterinarian." I'll call an actual veterinarian tomorrow. I'll keep you guys posted on the health of the pups and Kira. I blissfully ignore plans and drink coffee while doing it.